Solar water heating systems can be either active or passive, but the most common are active systems. 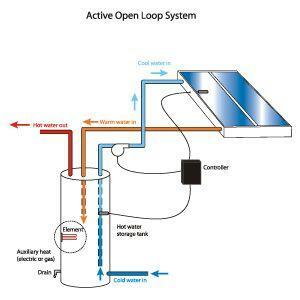 Active systems use pumps while passive solar systems run on gravity or thermosiphon. Northern Lights Solar Solutions designs application based around active systems closed loop with pumps and and digital controllers designed specifically for the solar industry. 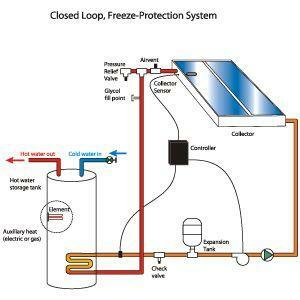 Solar water heating systems can do more than just heat your hot water. With modern day vacuum tubes, solar thermal heating can be used in many more applications. Home heating, space heating, solar air conditioning, and commercial solar heating are just some of the areas where solar thermal energy applications are being applied. With $1000s in government grants and low interest loans being offered in North America, Solar Thermal Heating is become the fastest growing alternative energy source both in the US and Canada. Call us to find out how you can take advantage of solar heating and save $$ today. Active Direct-circulation (open loop systems) use pumps to circulate potable water through the collectors. These systems are appropriate in areas that do not freeze for long periods and do not have hard or acidic water. These systems may require a recirculation freeze protection (circulating warm tank water during freeze conditions) and this in return requires electrical power for the protection to be effective. An open loop system operates at atmospheric pressure. A pool uses this method as it is generally not operated in freezing months. In an open loop system the usable hot water is directly circulated through the heating system. 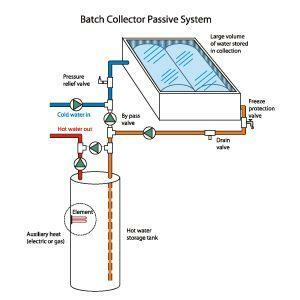 Passive solar water heaters systems move household water or a heat-transfer fluid through the system without pumps. They rely on gravity and the tendency for water to naturally circulate as it is heated (warm water is lighter and rises). Because they contain no electrical components, passive systems though simpler, have very minimal control for home use. Passive storage systems consist of one or more storage tanks placed in an insulated box with a glazed side facing the sun. These solar collectors are suited for areas where temperatures rarely go below freezing. They are also good in households with significant daytime and evening hot-water needs; but they do not work well in households with predominantly morning draws because they lose most of the collected energy overnight.